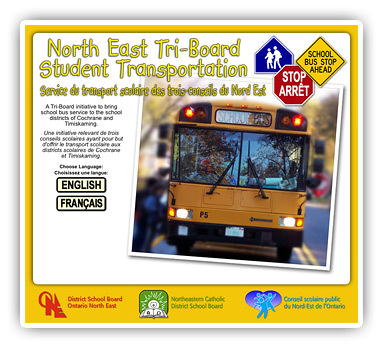 Take a moment to visit the North East Tri-Board Student Transportation website for more information on school bus transportation in the Northeastern Catholic District School Board. North East Tri-Board Student Transportation has secured a new five-year contract to provide busing services to three school boards in the districts of Cochrane and Timiskaming. The contracts were awarded through a two-stage procurement pilot project with the Ministry of Education. Why a partnership with North East Tri-Board Student Transportation? At the North East Tri-Board Student Transportation, we are committed to providing a safe and efficient transportation system to the school districts of Cochrane and Timiskaming. Tri-Board Student Transportation is continually monitoring and reviewing our transportation system for safety, route efficiencies and adherence to Board policies. You can access North East Tri-Board Student Transportation by visiting their website at www.netribus.ca or by calling 1-800-381-7280 in the Timmins, Cochrane, Iroquois Falls, Kapuskasing and Hearst areas, and at 1-800-461-8759 in the Temiskaming Shores and Kirkland Lake areas. Is my child eligible for school bus transportation? If you are wondering if your child is eligible for school bus transportation, this information can now be found online. North East Tri-Board Student Transportation subscribes to the GeoQuery Information Service for providing school bus transportation information. The GeoQuery website provides school information, will help you determine the school your child should attend, and to see if they are eligible for a bus school. View the Eligibility page to access the GeoQuery Information Service.